After my success with my basic artisan bread, I have decided to add flavors and started my “experiment”. Since I always love the combination of asiago cheese and bacon, I have to try it out this flavor– and it turns out delicious! And this is the best looking artisan loaf that I’ve made (sometimes I slit too deep and the breads look “exploded”, other times the loaves came out a little out of shape…)! 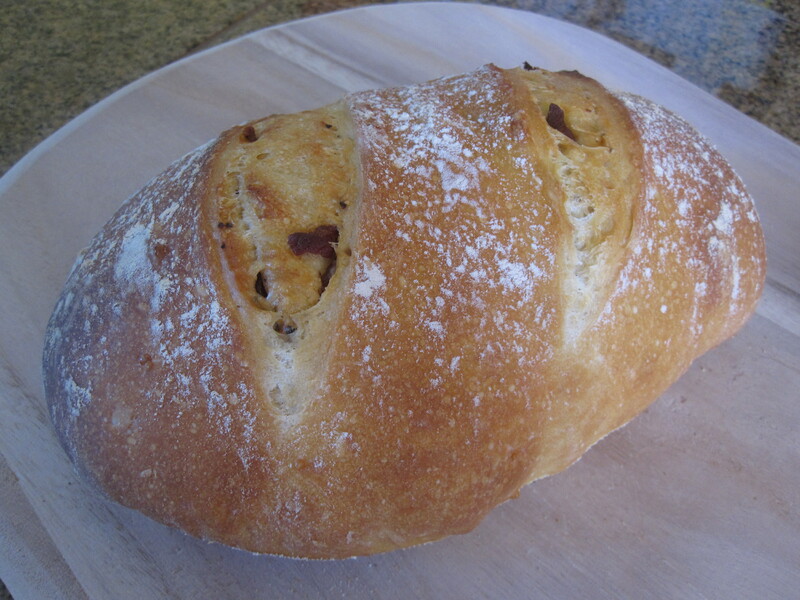 Artisan Asiago Bacon Loaf: Those big irregular holes indicates a good loaf. 6 1/2 cups unbleached all purpose flour– use 1 cup measuring cup and a knife to sweep flat. DO NOT use large 2-cup measuring cup. Stir flour, salt and cheese to combine. Add lukewarm water and yeast into a 6-quart container, whisk to combine. Add flour mixture to the yeast water while stirring using a wooden spoon, until the dough is evenly moist. The dough will look very wet. This should take no more than 5 minutes. Cover loosely with a lid and let the dough rise at room temperature until the top collapse or flattens (it took me about 3 hours). Snap the lid on but pull up lid a little so the container is not air tight. Now the dough is ready put into the fridge (the dough is ready for baking after this initial rise but it’s easier to handle after chilling. The dough can be kept in the fridge for up to 2 weeks). On baking day, sprinkle some cornmeal on a pizza peel (so the dough rests without sticking to the peel). Take out chilled dough, sprinkle some flour on top of the dough then use one hand to pull up some dough (about size of grapefruit) while use the other hand to cut the dough with serrated knife. With dough in you hand, gently pull stretch the surface of the dough and tuck in the bottom, giving it a quarter turn as you pull/stretch. Dust a little more flour to prevent dough sticks to you hand. This shaping process should not take more than 1 minute. 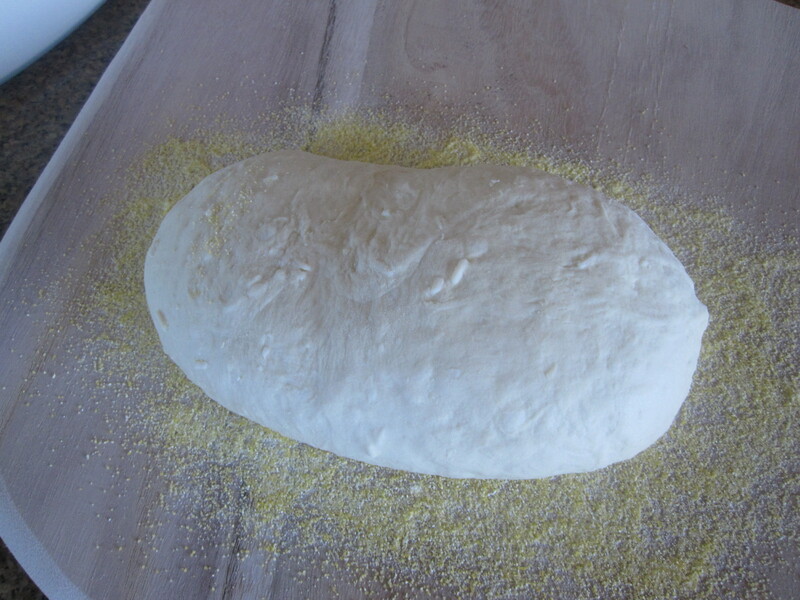 Dust a rolling pin and the board with some flour, gently roll the dough out to a 1/2-inch thickness. Dust little more flour to prevent dough sticking. 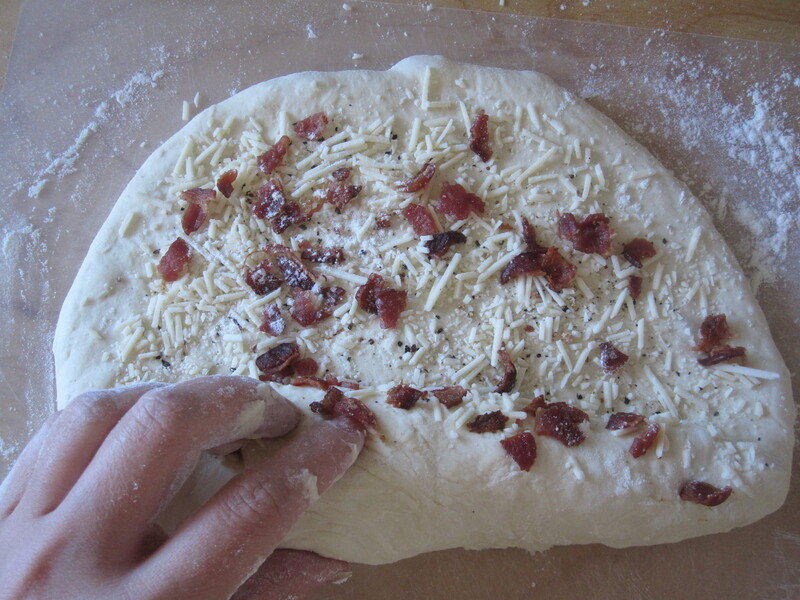 Sprinkle ground black pepper, asiago cheese and bacon crumbs on the dough. Then roll it up like a jelly roll. Fold up two ends on the seal side, and gently shape the dough to a long oval shape. 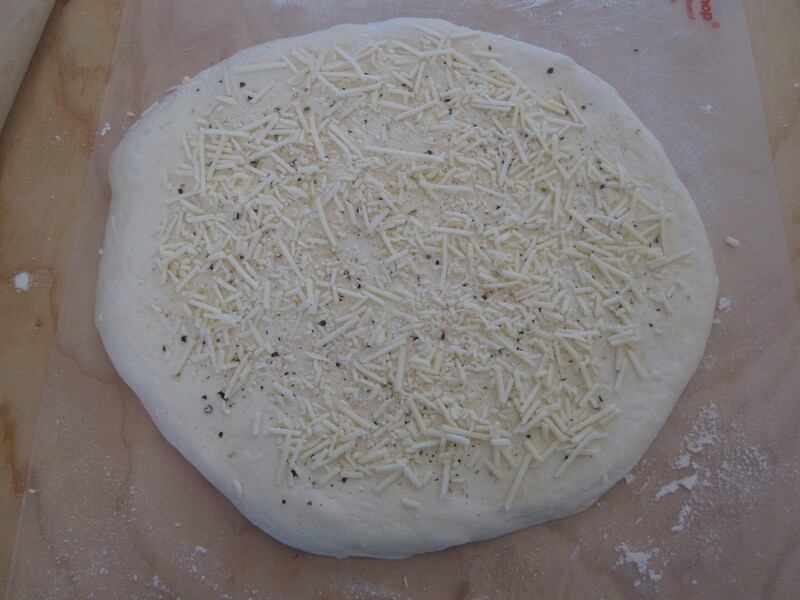 Place shaped dough on pizza peel, rest uncovered at room temperature for no more than 2 hours (depending on the room temperature–see note below). 20 minutes before baking, place pizza stone on the middle rack and a shadow pan at the bottom rack. Then preheat oven temperature to 450°F. Dust the top of the dough with some flour (so the dough won’t stick to the knife when making slit on the top) and make two slits(1/4 inch deep) on the top. Quickly and carefully slide the dough onto the pizza stone. Pour 1 cup of water into the shadow pan then quickly close the oven door. (To prevent last minute ‘surprise’ of the dough sticking to the pizza peel and losing heat from the oven, I always move pizza peel back and forth to test slide the dough before open the oven door). Bake for 30-35 minutes until the bread is golden and tap hollow at the bottom of bread. Remove bread from oven and cool immediately on a rack. Cool completely before slicing (for a crusty bottom, bake bread on the stone for 28 minutes, then remove water pan and transfer bread to the bottom rack for another minutes). When we work on the dough, it will lose some of its air pockets trapped by the gluten (this is why the shaping should be quick and gentle). To compensate this, we let the dough rest for a longer time so the gluten can start working and trap more air, thus creating a light loaf with lots of big air pocket. I used 2 bacon strips and the bacon is not very strong. If you want more bacon taste try 3 bacon strips. You can also use cheddar or Parmesan cheese for a different flavor. 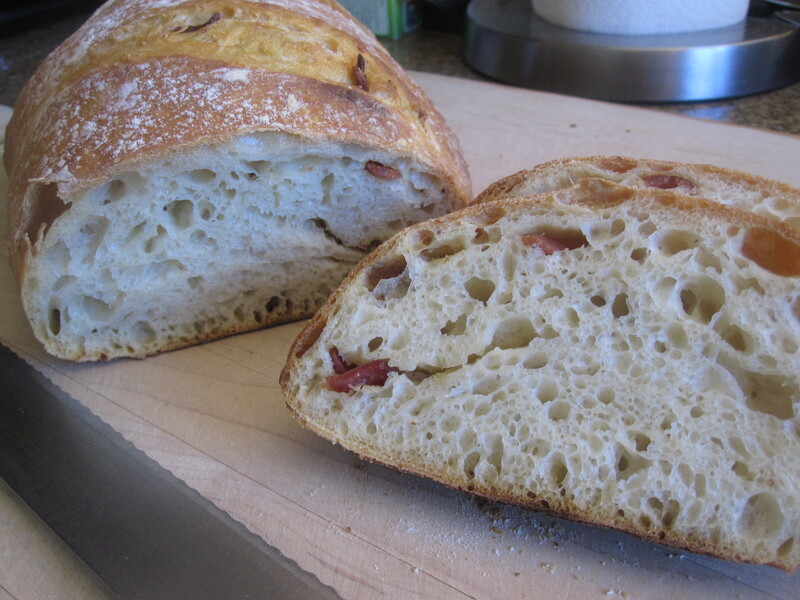 Artisan Asiago Bacon Loaf: Shaping is done. The dough is now resting on pizza peel for no more than 2 hours.